5 out of 5 stars - Michael Kors Berkley Leather Platform Sandal Black Women's sizes 5-11/NEW!!! 2 product ratings2 product ratings - Michael Kors Berkley Leather Platform Sandal Black Women's sizes 5-11/NEW!!! Make: LifeStride. Q: Are Your Prices Negotiable?. Then, place a new order for the item of your choice. Synthetic upper. These shoes are brown in color and feature a skinny wedge style heel, a zipper up the back of the 3" heel, and a strap across the toe of the shoe. KATE ANN BURGUNDY RED SLIP ON FLATS. FAUX LEATHER UPPER WITH FLEXIBLE RUBBER SOLES. COMFORTABLE AND PERFECT FOR WORK! LIFE STRIDE Farrow Women Slip On 1" Wedge Heels US Size 9 1/2 M DK Tan Amsler. Truly Like Brand New. Condition Worn 1 hr or Less with box. Beautiful style though a bit to Large for my Wife, I bought the wrong size. My loss is your gain for you. *Free Shipping! * Only shipments to U.S. Main Land. PAYMENT DUE NO LATER THAN 5 DAYS FROM END OF AUCTION.Winning items are sent within 2 days of receiving cleared payment. Thank you for viewing! Clarks Artisan wedge heel pump. Very good condition - bit of creasing, couple scratches & scuffs, bot of back outer edge heel cap wear. Heel height - 2 1/4". Black leather upper. Hush Puppies Soft Flex ANGLE-LO Low Heel Dress Shoes. Low 1" heel height. Color: White Smooth. Man-made Faux Leather upper & sole. 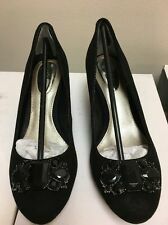 Beautiful Gianni Bini shoes in excellent condition. Light brown with Silver trim. From a smoke-free & pet-free facility.